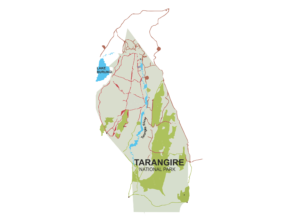 National Park: Named after the Tarangire River which crosses through the park, Tarangire is Tanzanian’s sixth largest national park. Here visitors can expect to see dozens of more than 550 species of birdlife, along with much other wildlife while travelling along the river. Dry season in Tanzania shrinks rivers, yellow grasslands, but still the Tarangire River flows. As other water sources dry up, hundreds of thousands of animals march to reach the river and here travelers can view the largest numbers of animals during dry season. Through the year, Tarangire hosts Tanzanian’s largest herds of elephant, and is along the trek of the wildebeest migration. Tarangire is the bird lover’s park, with swamps that house the largest concentration of breeding birds in the world – the Stockingthighed Ostrich. Tarangire is a spectacular park throughout the year and especially during dry season. With some of the most diverse landscape and vegetation in the region, this destination will surely provide a most memorable experience. 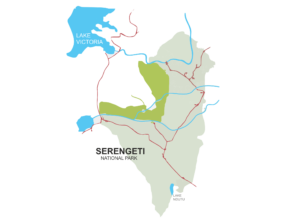 National Park: Serengeti National Park is located in the Mara and Simiyu regions of northern Tanzania, and borders Kenya to the north. The very name Serengeti conjures up images of wildebeests and zebras on their annual migration across the savannah, lions crouching in the long grass and a cheetah strolling at dawn. Perhaps best known for the annual migration of more than 1.75 million ungulates, the park’s diverse ecosystem also supports the prized “Big five” species, ( Lion, African Leopard, African Elephant, Black Rhinoceros, and African Buffalo). Along with the Big Five and the most famous of African animals, the Serengeti is home to many more natural wildlife including baboon, Nile crocodile, and more than 500 species of birdlife. This is why each year Serengeti hosts more travelers than any other of Tanzania’s national parks. Experience for yourself the herds, predators and unique birds that make up Tanzania’s favorite park. Visitors should plan several days in the vast, especially if interested in observing the awe-inspiring wildebeest immigration. 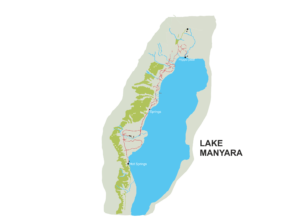 National Park: A shallow lake that stretches more than 30 miles at the base of the Rift Valley escarpment. Lake Manyara is perhaps Tanzania’s most scenic destination. Here you will experience breathtaking views of nature’s finest landscape including dense vibrant forest and acacia woodlands. Among the wildlife at this location are tree climbing lions, giraffes, and more than 400 species of birdlife, along with many other beautiful wild animals. 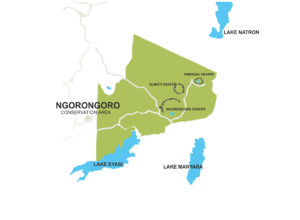 Conservation Area: Located between the Serengeti and Lake Manyara National Parks, The Ngorongoro Conservation Area is home to many protected ecosystems including the well-known Ngorongoro Crater. Easily one of Tanzania’s most popular attractions, the crater was formed two to three million years ago after the explosion and collapse of a very large volcano. The crater is now home to more than 25,000 wild animals including hippopotamus, wildebeest, lion, zebra, gazelle, and many others. The area is also populated by the Maasai tribe who have preserved natural harmony with the animals in the region. The crater is widely considered one of the world’s best locations for live game viewing.